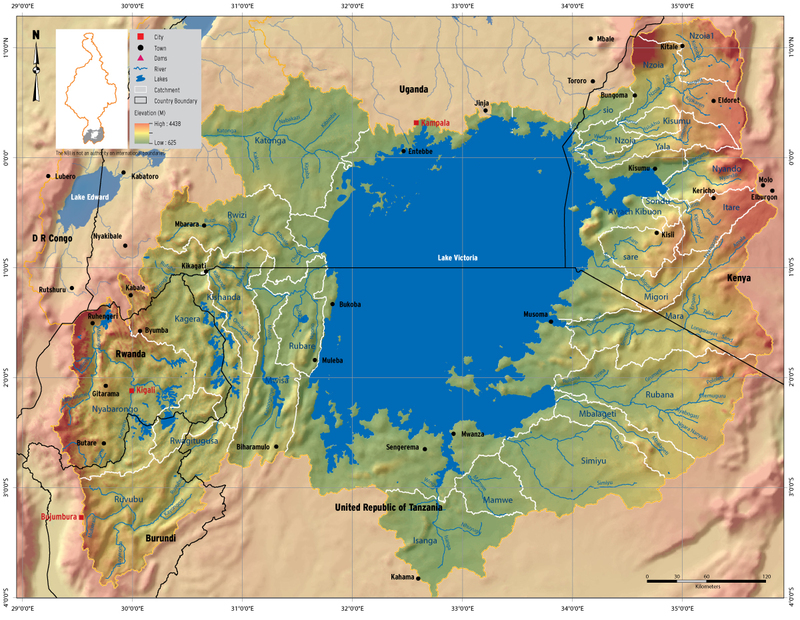 The Lake Victoria sub-basin is the area covering the lake surface itself and the catchment areas of all its tributaries. The outlet hydrological station is at Jinja. The most distant source of the Nile is the Ruvyironza River, which flows into Lake Victoria through the Ruvubu and Kagera rivers. Other rivers converging into Lake Victoria – the largest of the Nile Equatorial Lakes – include the Simiyu-Duma, Grumeti-Rwana, Mara, Gucha-Migori, Sondu, Yala, Nzoia, Sio, Katonga and Ruizi. The lake’s surface area is about 66,700km2 and occupies a large proportion of the entire sub-basin. Three countries Kenya (6%), Tanzania (51 %) and Uganda (43%) share the lake shoreline, and six countries share the basin: Burundi, DRC, Kenya, Rwanda, Tanzania and Uganda. The area around Lake Victoria has the fastest-growing population in East Africa, estimated to be more than 40 million in 2015. Lake Victoria is important for agriculture, industry, domestic water supplies, hydropower, fisheries, travel, tourism, and environment. The average annual precipitation over the sub-basin is 1368mm and the average annual potential evapotranspiration is 1486mm.